Recently RIM has arrived one of the most advanced device management solutions for the CIO’s and IT Admins. The device management tool introduced as BlackBerry Mobile Fusion provides an all-in one solution in device management for the array of mobile devices scattered hither and thither at workplace. This device promises to solve the long pending problem faced by IT Admins, who has been always living in nightmare due to lack of single solution to manage the variety of devices. 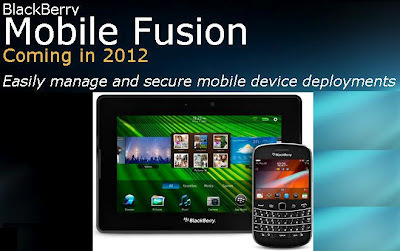 BlackBerry Mobile Fusion avails the management of several mobile platforms to include BlackBerry smartphones, iOS (version 4 or later), Android (version 2.1,2.2,2.3), PlayBook Tablets, and future BlackBerry 10 devices. By means of an easy to use web-based interface and Administrator panel, the processes like activation, audit, performance and other management tasks can be handled easily through the device. BlackBerry Mobile Fusion provides, BlackBerry Device Service - provides management features for BlackBerry PlayBook tablets; Universal Device Service - provides management features for devices that use the iOS and Android operating systems and BlackBerry Mobile Fusion Studio - a web app that brings a single place for management of mobile devices, users, configurations, policies and more.